The nave and lower tower are C12; the top of the latter is C13, probably later than the south aisle of c1200. The spire is of c1603 and the chancel is mostly of 1855. 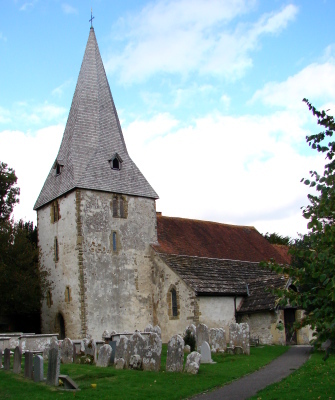 The location of Bury church by the Arun has earned it a picture in many guidebooks. From an early date it belonged to the abbey of Fécamp and it is mentioned in Domesday Book (5, 3). The oldest parts today date from the C12, when the church consisted of a tower, an aisleless nave and a chancel. Though rebuilt, the short dimensions and offset to the south strongly suggest the last has a C12 origin. The rubble-built north nave wall is most obviously C12, with the jambs of the original north doorway under a C15 window and it is unusually far east. The lower part of the unbuttressed tower is late C12 and its pointed arch has a single chamfer and square responds with plain abaci. 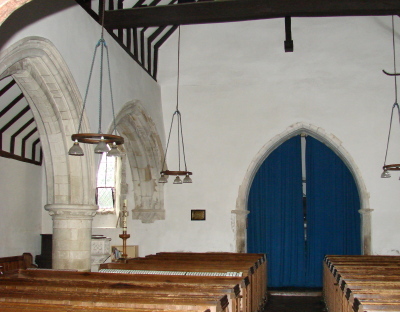 The long, narrow lancets are round-headed externally, but the rere-arches are pointed, like the plain west doorway, though in accordance with their date, they have no scoinsons. 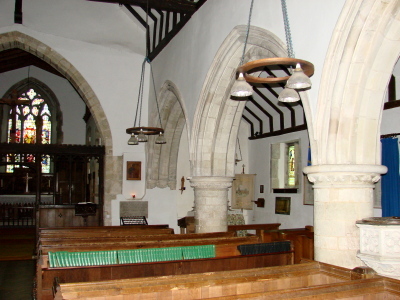 About 1200, a south aisle was added and its three-bay arcade, despite restoration, is of fine workmanship. The round piers have high bases, water-holding bases and well carved stiff-leaf capitals, supporting arches of two orders, the inner ones chamfered and the outer ones moulded. The unusual responds have three foliage corbels, one for each part of the arch. Little remains of the original windows beyond a filleted roll-moulding on one jamb of the rere-arch of the later west lancet. The tower was built up to its present height shortly afterwards, with pairs of plain pointed bell-openings. The broad C14 chancel arch has a characteristic hollow-chamfered head, dying into square responds without abaci. In 1849 there was a square-headed south window with two ogee-headed lights (Adelaide Tracy II p44), so there was further work in the chancel at this time, though apparently without altering its dimensions. Other C14 work included a north nave window with an elongated sexfoil in the head, as found at West Chiltington, and the trefoil-headed lancets at both ends of the aisle (the east one now opens into a vestry). Of later mediaeval work, the nave window over the north doorway (see above) is C15 (partly renewed) like the rood-stair, of which the remains are south of the chancel arch. The sill of the north east nave window has been lowered, possibly also for reasons to do with the screen or roodloft. The masonry south porch looks C16 and the presence of a stoup by its outer arch shows that it is pre-Reformation. The lintel set in its roof has a depressed head and the doorway is of the same date; its similar head is set in a square hoodmould. The nave roof is dated 1603, just after the survey of the previous year had noted that its precursor was ‘suncke from the steeple to the great danger of the Churche and chauncell’ (SRS 98 p31). It now has crownposts and chamfered tiebeams and is lower pitched than before, as the line of the previous one on the east side of the tower shows. The spire was built or replaced at this time and so was the plain mullioned window in the south aisle. Probably in the later C18, a west gallery was installed. This was lit by a plain window high in the north nave wall. There was a restoration about 1855 (according to Kelly’s Directory of that year this was confined to the interior, though Peat and Halsted state (p61) the chancel was rebuilt) and another (when a south vestry was built) in 1877 (WSRO Ep I/40/5586). 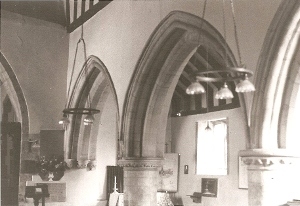 Nothing of the chancel looks old, including the roof. If rebuilt in 1855, it is odd that at a further restoration in 1893 by L W Ridge (WSRO Ep I/40/5692) the east window was replaced. He removed the gallery and planned to replace the north west window and to rebuild the west wall and roof of the south aisle, but there is no sign any of these was carried out. A third restoration said to have been in 1903 (Harrison p81) has left no trace and may result from confusion with that of 1893. Font: C15 octagonal. On each side is a quatrefoil containing a rosette. There are more rosettes on the sloping underside of the bowl. 1. (North nave window, formerly) Arms of Richard Earl of Arundel (d1392). Probably contemporary. 2. (South chancel) F A Woodhouse, 1868 (www.stainedglassrecords.org retrieved on 4/2/2013). The drawing by this otherwise unrecorded designer is of quality, though it is old-fashioned for the date. 3. 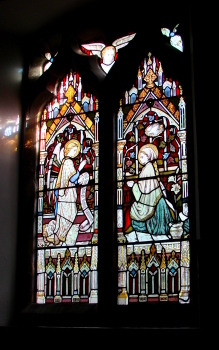 (South aisle window) C E Kempe, 1880. The composition, now worn, is carried across the two lights. 4. (East and centre north windows) J Hardman and Co, dated 1894 and 1889 respectively (Index). Niche: (By pulpit) Narrow and round-headed with traces of painting. Possibly C12. Piscina: (Chancel) Trefoil-headed. It looks C19, but probably replaces a C14 one. Pulpit: Oblong in plan and dated 1628. It was clearly assembled at a later date from genuine panels of that period. Reredos: 1910 (Peat and Halsted p61), elaborately carved with the Nativity and other scenes. Screen: C15. Narrow cusped openings with small openings in the base to allow kneeling worshippers to see the altar.